Final What the Truck?! event of the season is Friday at Churchill Square! 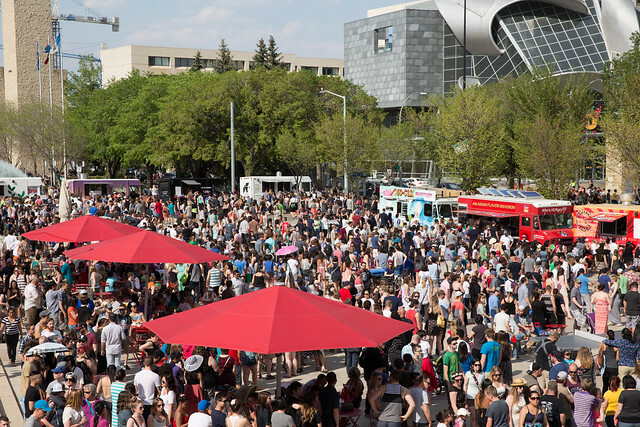 What a season we’ve had for food trucks in Edmonton! We’re up to well over 70 trucks in the Edmonton area now, which is great news for diners looking for diverse menu options and lots of selection. We’ve had a good year with What the Truck?! more specifically as well. By the time our season is done this weekend, we’ll have featured more than 60 different trucks at our events and already this year we’ve connected 250 events with food trucks. You can check out the full lineup and menus here. This is our second event of the year at Churchill Square, as we started the season there back in May. If you came to the May event this year and had a negative experience, I’d encourage you to give the event another shot. We’re always learning and trying to improve things, and we’ve worked with the food trucks to make some behind-the-scenes changes that should help. The number of menu items has been reduced, we’ve implemented a line-management system so that you don’t get stuck waiting for something that is sold out, and of course we have ten more trucks! If you came to our June, July, or August events, you’ll know that May was unusually busy and that your typical experience is much more positive. If you’ve never been to What the Truck?! before, that’s okay too – we’d love to see you on Friday! Be sure to come prepared by checking out our FAQs and reading our Tips & Tricks page. Stay tuned to our website, Facebook event, and Twitter for updates and other details!